A cosy way to have a fire in the garden is to place a fire bowl. Fire bowls add a special touch to the garden when they’re lit. But even when they’re not used, they’re real eye-catchers. Fire bowls come in a variety of sizes, types and designs. 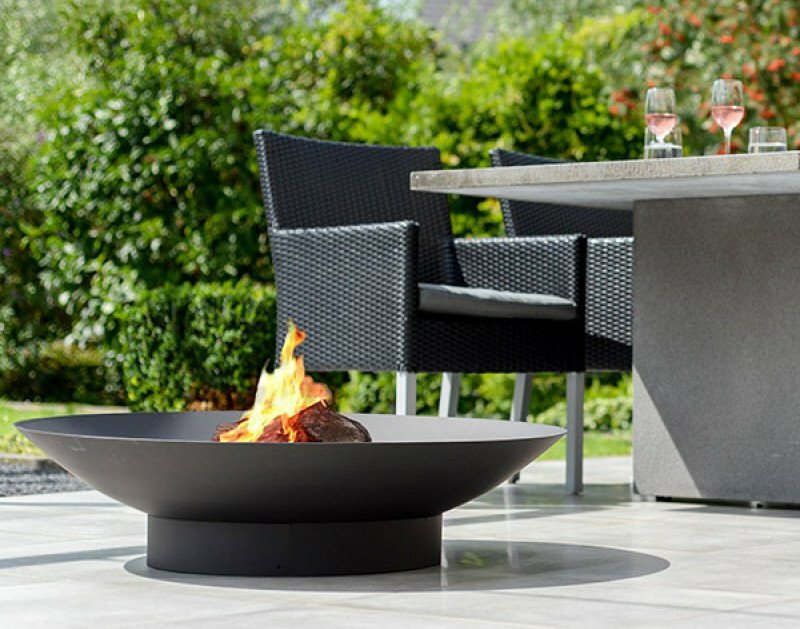 Firepit-online.com sells fire bowls featuring both modern and more traditional designs. With the purchase of this kind of special fire bowl, you can be assured of a long-term investment for your garden. MOODZ fire bowl (Ø 60 cm) available in 5 sizes! Do you want to buy a fire bowl? Then you have come to the right place at Firepit-online.com! the pleasant warmth coming from the fire. Our product range consists of various fire bowls from brands such as Esschert, Barbecook, 2L Home & Garden and Storm Lifestyle. fire bowls made of cast iron. There is something for everyone. A large number of fire bowls is made of cast iron. This material is particularly strong and lasts long, even if you use the cast-iron fire bowl intensively. Cast iron is resistant to the heat of the fire so that the bowl retains its shape. You can easily recognise a cast-iron fire bowl, as this material has a very robust appearance. Fire bowl are undisputed atmosphere makers and also provide the necessary warmth when it is a bit fresher. Many fire bowls are also very suitable for barbecuing or grilling. Delicious outdoor cooking over a real wood-fired fire, who would not want that? Separate barbecue grills or grill plates are now available for many fire bowls. You simply place this on the fire bowl and you can cook deliciously. Do you want it more luxurious or comfortable? Then the OFYR BBQ may be something for you. This beautiful corten steel cooker contains a high base with the fire bowl and griddle, also known as plancha. When you stow away the fire bowl after use, it is essential to throw out ash residue and the like first. The only maintenance the fire bowl needs is to be stowed away under a shelter, in a shed or in a storage room. The fire bowl will then be less likely to wear or rust. But of course, also the purchase of a protective cover contributes to the lifespan of your fire bowl. You can, however, never completely prevent corrosion, but you can, of course, after due time, provide the fire bowl with a new, heat-resistant coating. The aerosols with heat-resistant paint are available with us. Are you convinced? Then order your beautiful fire bowl now! The choice of cheap fire pits is enormous. If you have made your choice, you can order the fire bowl online. If you order before 17.00, your fire bowl will be shipped the same day for a quick delivery at your place !